As you know, the Holga is famous for being the plastic medium-format camera that yields classic lo-fi photos with the shadowy vignettes and unpredictable light leaks. 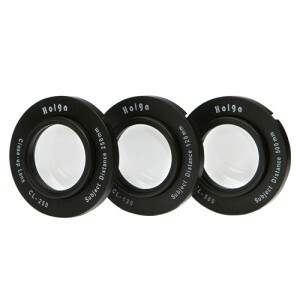 We now want you to meet this set of 3 lenses that will enhance your Holga experience! With the Holga Close-Up Lens Set, you can take your best shots at closer angles! Paypal is always a preferable payment method. Item(s) will be sent in 2-3 business day after the payment is cleared, not included Saturday, Sunday and all Hong Kong public holidays. We'll sent the item(s) as gift, if there still have any duties, taxes and import expenses are buyer's responsibility at your country. If you buy more than one items, combine shipping and handling service is provided. If you have any special instruction after you won the item. For example, different delivery address, need an invoice, etc. Please contact us or leave a message to us immediately after the auction closed. And please left a reminder in Paypal notice (if you settle the payment with Paypal), then it can make sure that we won't make any mistake. All winners should settle the auction payment within 7 days after the auction closed. If you need to use other payment method or other special instruction. You should try to contact us within 7 days after the auction closed too. A negative feedback must leave for all disappear or irresponsible winner! !